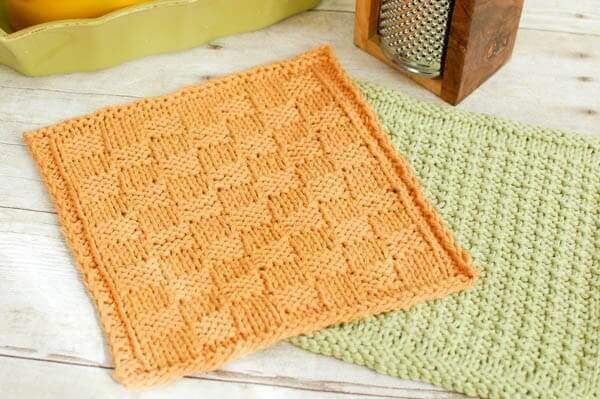 I love making dishcloths … they are perfect for when you just want something quick and fun, not to mention a way to add a little freshness and color to your kitchen! I have made so many crochet ones over the years (I have lots of free crochet dishcloth patterns here), so I thought I would share some knit variations for my knitting friends out there. 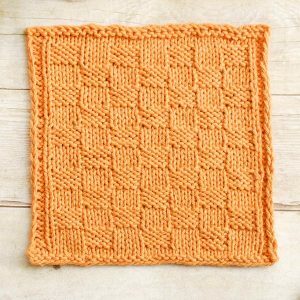 I just love the look and feel of this Basket Weave Knit Dishcloth Pattern. I will be writing up and sharing the pattern for the green washcloth soon too. Enjoy! Cast on 36 stitches (I used the long tail cast on method). Row 1: Slip first st knitwise, knit across. Row 3: Slip first st knitwise, knit 2, purl until 3 sts remain, knit 3. Row 4: Slip first st purlwise, purl 2, knit 5, *purl 4, knit 4, rep from * until 4 sts remain, knit 1, purl 3. Row 5: Slip first st knitwise, knit 2, purl 5, *knit 4, purl 4, rep from * until 4 sts remain, purl 1, knit 3. Row 8: Slip first st purlwise, purl 2, knit 1, purl 4, *knit 4, purl 4, rep from * until 4 sts remain, knit 1, purl 3. Row 9: Slip first st knitwise, knit 2, purl 1, knit 4, *purl 4, knit 4, rep from * until 4 sts remain, purl 1, knit 3. Rows 12 through 43: Repeat Rows 4 through 11. Row 44: Slip first st purlwise, purl 2, knit until 3 sts remain, purl 3. Row 45: Slip first st knitwise, knit across. Row 46: Slip first st knitwise, knit across. I am sorry … which part are you having trouble with? Rows 4 to 11 form the pattern, so when you have knitted row 12, for the next row, follow instructions for row 4, and so on to Row 11. Repeat those 8 rows that make up the basket pattern until you have actually knitted 43 rows altogether. I’m always on the lookout for good dishcloth patterns. I’m dying to try this one!! Maybe for my mom for mother’s day?? She’d LOVE!! What a gorgeous dish cloth! having trouble finding the directions for the light green one shown with the basket weave. Hi Carol 🙂 That one will be up next week. So cute 🙂 I pinned these to my “When I Learn to Knit” board – hehe. I need help please. I am a beginner at knitting and An advanced Crocheter so I am sure I can make this pattern except for one set of terms that has me baffled. At the beginning of each row it says to slip one stitch knit wise. What does this mean? Should I just move the first stitch to the right needle wwwithout doing a yarn over? Love this pattern and the 3 color one too. Time to start making dishcloths I need a lot to put into the church Xmas food baskets plus gifts and even some to sell. Thank you for sharing! Put your right needle into the stitch as if you were going to knit it and just slide the stitch across. Yes, you put the right needle into the first loop as if you were intending to knit a stitch, but then just move it to the right needle as you say, without putting the yarn over. Wish I could crochet but can only do a simple chain. When get to the loops, it ends with a very peculiar shape! I also love making dishcloths. I am sure I wouldn’t be able to count all the dishcloths I’ve made over the years. At the moment I have a drawer full of them! But all that I’ve made have been crocheted. Thanks for sharing this knit pattern. It will be a good way to improve on my knitting skills! I’m looking forward to giving it a try.